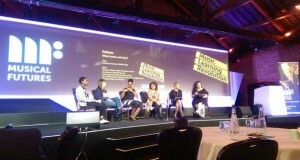 I was very fortunate to attend the Music Learning Revolution conference at the Brewery, London last week. Expertly organised by Musical Futures it had more of the atmosphere of a festival, rather than a traditional conference. There was a real buzz from the beginning, very much due to the keynote presentation by Lord David Puttnam. It’s rare to hear someone talk so passionately and with such reflection on the power of music in the films that he made. Truly inspiring. The main space was also packed with over 400 delegates, representing the breadth of music education in the UK, and beyond. It was great to see music hub leads, teachers, music practitioners, academics, policy makers and funders all in the same space, and all actively contributing to the debates and workshops that took place across the day. There were four main panel debates which covered diverse topics including formal and informal learning, whether assessment can be innovative and creative, do you need to be a trained music educator to teach (my personal favourite), and what music we should be using and why. All the panels were lively, with a range of experts giving their particular take on the themes, but what was most refreshing, and I would like to thank Musical Futures for enabling this, was that there was a member of Wired4Music, our youth engagement programme, on three of these panels. I feel strongly that young people’s voices are a key part of any debate and I am immensely proud of Gabrielle Chudi, Siân Dicker-Thorne and Loretta Tosson, who each contributed passionately and eloquently across the day. It was particularly great to hear colleagues in the audience comment that their presence on the panels really grounded the debate. Alongside the main debates Inspire Music, the new Paul Hamlyn Foundation initiative which Sound Connections is also involved in, hosted a number of Open Space sessions. These provided a forum for teachers and practitioners to share effective practice from their classrooms and settings. I helped facilitate two of these sessions and it was enlightening to hear how Jane Parker works in early years settings in the south west, and how Karen Lester supports singing in primary schools in the north east. Both these sessions provided useful and practical advice and resources and highlighted the open and sharing ethos across the whole day. As well as over a dozen other practical workshops, covering technology, beatboxing and song writing amongst other topics, there was also a variety of retailers and organisations associated with music education offering practical advice, support and the odd freebie. In addition, the quality of the food and refreshments, as well the venue itself, was outstanding, which I feel is important given how difficult it is for teachers to be released from school these days.